Bossier Sheriff Julian Whittington releases the 2018 crime statistics that show overall crime in Bossier Parish continues to decrease despite a surge in population. There were at total of 852 crimes reported in the parish in 2018, compared to 862 crimes reported in 2017. 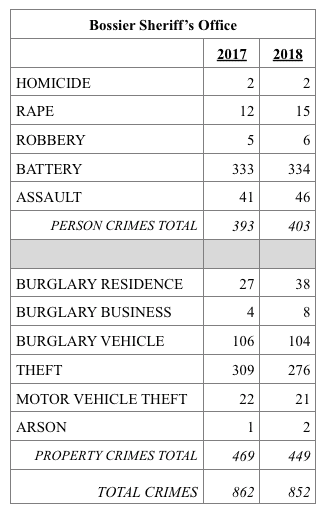 This number includes 403 person crimes and 449 property crimes.